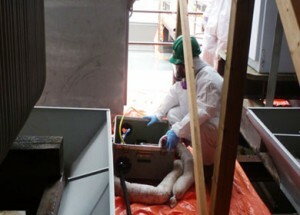 Tri-Phase emergency staff was called to respond to a PCB spill in a downtown tower building. 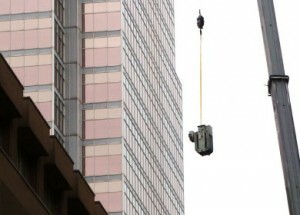 One of nine transformers containing PCBs had leaked Pyranol (a high level PCB liquid) onto the roof of the building which subsequently made its way into the rain water leader. Pyranol oil, a DNAPL product, spill response is a complex, challenging and cross-disciplinary skill, which requires highly specialized and experienced emergency staff. As such, Tri-Phase dispatched an emergency response team that arrived on site within the hour in order to address the immediate needs of the spill. The team began by addressing the source of the spill, allowing it to be contained to the immediate environment. 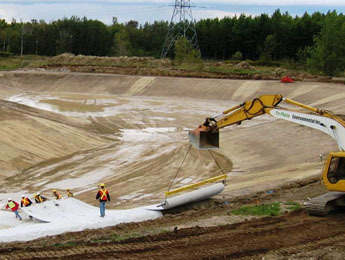 Once the source of the spill had been contained and the potential spread of the contaminant had been prevented, Tri-Phase proceeded to isolate and bypass the contaminated rain water leader to prevent spread of contamination. Following primary response, Tri-Phase divided the site into contaminated and clean zones. Work proceeded to remove, package, transport and dispose of any contaminated materials including, but not limited to, roofing material, rain water, building structure and equipment. Any building materials that were removed during these efforts were replaced by Tri-Phase as part of the recovery phase of emergency management. This incident expedited Phase Two of the project, which called for the replacement of all nine transformers with non PCB-containing transformers as per the new PCB Regulations. The typical wait time for a new transformer is 9 to 12 months; however, Tri-Phase was able to arrange for the replacement transformers to be delivered within two months. Furthermore, Tri-Phase was able to maintain power to the building during the entire course of the transformers’ replacement project.